Located close to Cancun, towards the northern most end of Riviera Maya, and a short drive from Cancun International Airport, Haven Riviera Cancun is an all inclusive, adult only, all suite beachfront resort hotel. Situated on a secluded stretch of shoreline, Haven Riviera Cancun offers five star amenities, personalised service and sophisticated design. It’s great for couples in search of a romantic holiday, and groups of friends who enjoy spa and wellness breaks. Within each of the hotel’s suites you’ll find restrained and contemporary Mexican décor, king size beds, personalised mini-bars, personal pillow and aromatherapy menus. Views are either ocean or garden, and upgrades to Haven’s exclusive Serenity Club suites add private check-in, exclusive lounge, beachfront accommodation and additional VIP services. There are five restaurants offering a choice of authentic Mexican at Agua Bendita, vibrant Asian Fusion cuisine from the chef’s of Satsu, refined Mediterranean gastronomy at Olio and excellent seafood. 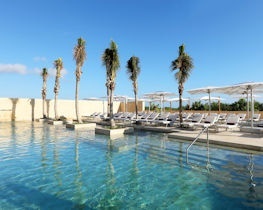 The hotel is also home to one of Cancun’s the finest spa retreats, the MySenses Spa. 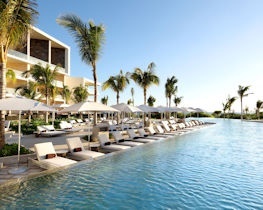 It features state of the art services and personalised therapies incorporating Mayan healing philosophies to create a wonderfully unique wellbeing experience. Amongst the hotel’s lush tropical landscaping, you’ll discover three swimming pools, a giant Jacuzzi, tennis courts, jogging trails, bike trails and various sports facilities and athletic courts. There’s a scuba-diving clinic and beach-volleyball games, yoga and aerobics classes, Spanish lessons, spirits tastings, and live-music performances. For selected stays between 18 April 2019 & 20 April 2019 receive 1 free night in 7. For selected stays between 29 November 2019 & 17 April 2020 receive 2 free night in 14. For selected stays between 29 November 2019 & 24 April 2020 receive 1 free night in 7. Honeymooners receive a welcome letter from the Managing Director, special romantic turn-down service on the first night, chocolate dipped strawberries, bottle of premium sparkling wine, one romantic three course a la carte dinner, one Lasting Moments breakfast in bed per stay, Honeymooners cocktail reception, and a farewell present from the Managing Director of the resort. Honeymooners also receive 10% discount on the Lasting Moments photo package and all MySenses spa treatments (discount not combinable with any other SPA promotion, discount, coupon or credit). for bookings made between 18 April 2019 and 31 October 2019 and arrivals between 18 April 2019 and 31 October 2019. Prices apply to Romance Junior Suite. Wedding certificate is required upon arrival. Only applicable to couples staying within three months of their wedding. Honeymooners receive a welcome letter from the Managing Director, special romantic turn-down service on the first night, chocolate dipped strawberries, bottle of premium sparkling wine, one romantic three course a la carte dinner, one Lasting Moments breakfast in bed per stay, Honeymooners cocktail reception, and a farewell present from the Managing Director of the resort. Honeymooners also receive 10% discount on the Lasting Moments photo package and all MySenses spa treatments (discount not combinable with any other SPA promotion, discount, coupon or credit). for bookings made between 18 April 2019 and 31 October 2020 and arrivals between 01 November 2019 and 31 October 2020. Prices apply to Romance Junior Suite. Wedding certificate is required upon arrival. Only applicable to couples staying within three months of their wedding.